Hi again, another entry already! Wonder's never cease to amaze - and all that, lol. First, let me start off by saying that I'm on holidays this week and go back to work on Wednesday next week. So what have I been doing with all of this free time? Well! I've done something I've been wanting/needing to do for a long time! I've been reorganising my craft/tv/office room. And I don't just mean a little bit - I've completely reversed the layout and made the crafty/office area the main part instead of the little bit. I have so much stuff! I still have stuff in other rooms and need to empty my wardrobe of 'junk?' and put my clothes in there...but I've only been concentrating on setting up my crafty area. I'm loving this new layout and extra storage! There's another desk with my monitor on it and my silhouette cameo, but I've messed it all up already by creating my first card in the challenge bonanza on IBS, lol. 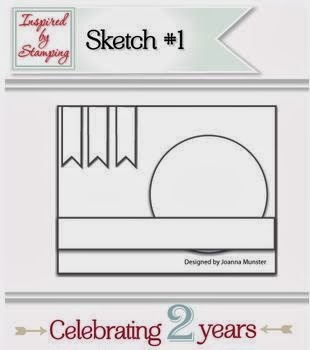 It's Inspired By Stamping's 2nd birthday and Joanna Munster is celebrating in style! Check out the challenges currently going here. Entries for all of these challenges must be in by October 17th 2013. The prizes are huge: each winner will receive the entire October 2013 release valued at $83! It's taken me this long (all week) to get into my craft room and create something - and I have to say I really like what I came up with. I was a bit daunted by the sketches and now I think I've grown to appreciate how they can push you to go outside your box and try something new! You can't really see that there is a bit of the flowery background under the banner - due to the angle I took the picture at. 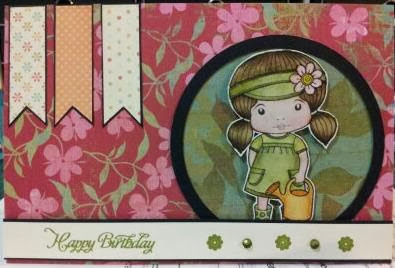 I had the girl (Marci - La-La-Land Crafts stamp) in my stash - I'd stamped her in stazon and water coloured her with Tim Holtz Distress Inks. I cut the background leaf pattern and the black frame with a Martha Stewart Circle Cutter (I actually got it to work properly for once!) and layered the frame over the green circle and popped Marci up on dimensional foam pads. The flowery background and green papers are both from a giant stack I got at the Papercraft Expo a few years back - the pad is from My Minds Eye - 29th Street Market designer papers. The banners were cut from First Edition papers - Boho Chic. The sentiment is from Inspired By Stamping - Fancy Sentiments and the flower stamp from StampinUp - Itty Bitty Bits stamped in Old Olive ink. I didn't have any green gemstones so I coloured a couple with an alcoholic copic marker. The card base is white 300gsm cardstock. Whew, time to catch up with the girls on StampTV and get to starting my second sketch entry. Karen this great! I intended to use this sketch as I am not one for sketches but this looked like one I could do, hope to get mine done tonight! Oh, love how you have coloured Marcie too! Thanks Marcelle, and it's really hard to stuff up colouring these Marci and Luka stamps, they're so cute! I saw yours, you did a great job too! I find sketches and colour challenges really hard too! your card is so pretty and you did fantastic on the sketch!!! So glad you shared with us on IBS. 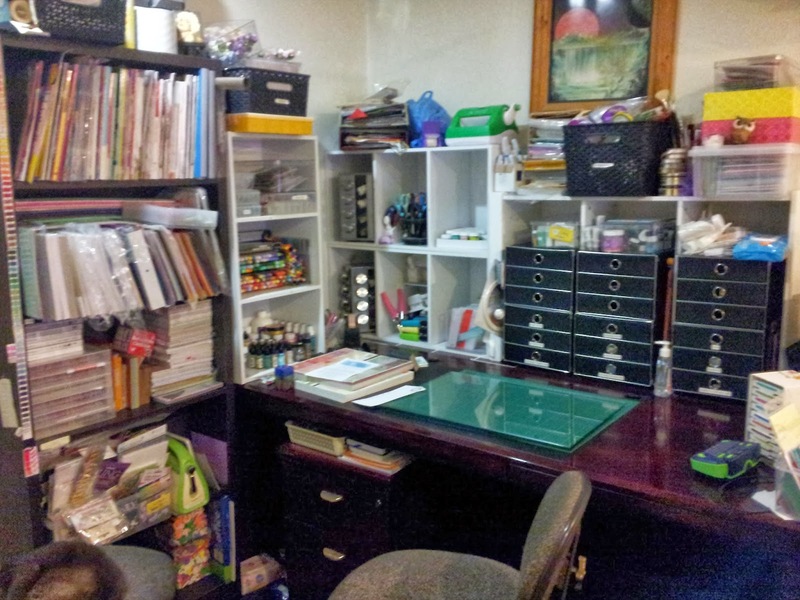 Your crafty space looks great! I love organizing :) So glad you joined the IBS celebration with your sweet card, love the little banners you added! Thanks Lyn, it's a great space for creating! Awesome take on the sketch! You done good! - Thanks for joining in with IBS! Thank you Vicki, love your comment!